I don't know whether to be proud or aghast. There are many things I want to say about the Democratic Congresspersons "occupying" their own meeting chamber. This being an opinion essay, I'm going to reverse the "inverted pyramid" and start with the least important--which is, oddly enough, the issue that would be my acid test for a politician were I to be a single-issue voter: gun control. House Democrats staged this sit-in, disrupting the chamber's business and leading House Speaker Paul Ryan to take draconian, and futile, steps to stifle media coverage of the protest, in an effort to force a vote on the weakest gun control legislation yet to crash against the insurmountable reef of gun lobby influence: barring persons on the terrorist watch list from purchasing guns. Had this measure been in place, it would have done nothing to prevent any of the mass shootings that have proliferated since the Assault Weapons Ban expired. Should it ever see the light of Congressional day, it will not prevent a single one of the thousands of annual American gun deaths due to crime, domestic violence, reckless negligence, or suicide. The only thing that can begin to reverse this death train is getting guns out of the hands of amateurs and criminals, and the only way to do that is to either re-interpret the Second Amendment to mean what it literally says (it's all about a well-regulated militia, not an unregulated anarchic free-for-all for civilians) or to repeal the damn thing and start over. 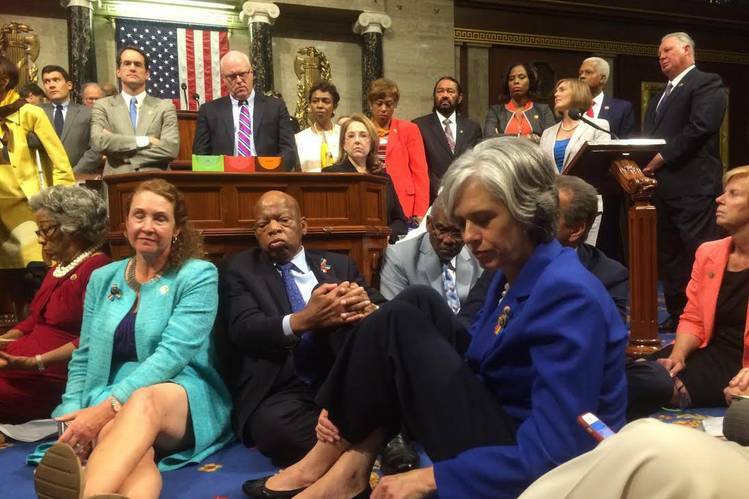 But back to the sit-in: it was only peripherally about trying to get even a thoroughly diluted piece of gun legislation up for discussion as the nation reels from the worst mass shooting in history (and before the next NRA poster child opens fire on the next crowded place to a chorus of useless "thoughts and prayers"). Fundamentally, this protest was about what the House has become: a gerrymandered abomination of abusive parliamentary government that in no way resembles the republican ideal it was created to embodied. Parliamentary democracy operates with a winner-take-all ethos: whichever party (or coalition of parties) wins the election dictates what legislation will be considered, voted on, and passed for as long as the government remains in office. The task of the minority is to criticize the majority, to vote consistently against its agenda, and to maintain an ongoing alternative media voice; in two words, to be the "loyal opposition." Only another election gives the minority any voice at all in the actions of the legislature. As conceived by the founders, the House was to be the people's chamber, a legislature elected directly by citizens. This was representative (small "r" republican) democracy at its purest. Congresspersons were to propose legislation, debate it, amend it, compromise on it, and ultimately batter out a consensus document that, with a majority vote, could be sent on to the Senate, and then the President, for ratification and enactment. While minorities might not be able to pass their own pure agendas, they could at least be heard, especially if they were willing to work across the aisle. All of which assumes the House leadership is working with the best interests of all the people at heart. Instead, the Republicans have taken their control of Congress to be a lock on not just the passage, but even the consideration, of legislation. Permitting even the most watered-down gun control legislation to come to the floor means permitting debate on an issue the NRA-owned party refuses to admit even exists. Even though the majority of Americans favor far stricter gun control measures than those being kept off the floor, the House leadership need not fear losing its majority in the next election, for the Republican party has so cynically and insidiously manipulated the system for redrawing Congressional district boundaries as to lock in Republican control of the House for decades to come. The House represents a gerrymander empowered minority, while the majority of Americans go under-represented in this chamber, not even given a protest voice by the absolutist Republican leadership. This is what House Democrats were really protesting with their sit-in: a legislature perverted by power politics to prevent it from enacting the will of the people it was created to represent. When democracy has been effectively shut down; when the rules of representative democracy have been mangled to lock out the opposition; when minority voices have been repeatedly and consistently silenced; then there is nothing left to the opposition but to protest. That's why I'm proud of House Democrats for staging their sit-in. It bothered me at first, for I am, at heart, a Congressional Democrat. I believe in representative democracy, in the legislative process, the free exchange of ideas, the perfection of legislation through amendment, compromise, and reconciliation between legislative chambers. I would much rather see gun control issues be vehemently argued on the House floor, even though, in the end, the legislation would almost certainly go down to defeat. But that's no longer happening. The House has ceased to function as a representative institution, and there are no alternatives left but protest. This has happened before. Sixty years ago, almost a century after the end of slavery, African-Americans were still unrepresented and oppressed throughout much of the United States. Democracy had failed them, was no longer available to them in any way. To obtain it, they had to confront their oppressors, peacefully, respectfully, but disruptively. John Lewis was on the front lines of those protests. Since 1987, he's been a member of Congress. Last week, he led the sit-in. What was happening in the House was becoming uncomfortably familiar, so he acted in the only way left to make his voice, and the voice of his party, heard. Speaker Ryan did everything he could to shut down the protest, turning off the C-SPAN cameras, demanding the protesters surrender their cell phones, soldiering on with the anti-fiduciary vote even as the protest continued, and finally calling an early holiday recess. None of it worked: internet-enabled publicity kept the protest in the public eye. It did not, in the end, get the legislation on the floor; but it did make the voice of the opposition public. In fact, it may have resulted in far more attention being paid to the issue. I'm worried about where this is headed. When the House reconvenes, will the sit-in pick up where it left off? And when, finally, Democrats are able to put together another majority in the House, will Republicans simply engage in the same tactics they've seen used against them in this protest? Does representative democracy have a future in this country? Or will our President be forced to enact all policies by executive order? Then again, representative democracy hasn't been working in this country for at least six years. The Republican party has become almost 100% RINOs (Republicans In Name Only) in a way that conservatives never anticipated: they've rejected the republic. It remains to be seen if Democrats can restore it by living up to the name of their own party.